If there is a business-owner version of a monster hiding in the closet, it’s the IRS informing you of a tax audit. Even for small business owners, the likelihood of an audit is vanishingly small, but the potential expense and hassle of an audit worries many of us. But how much does it really cost if you get audited? According to our experts, it depends on the kind of audit – and the reasons behind any discrepancy. The potential cost of an audit depends on the kind of audit your business undergoes. Although the labels are varied, most fall into three conceptual buckets. Correspondence Audits – Usually conducted by mail or telephone and concerning either a single line item or a small dollar amount. Even at the worst, these take up little time and money. It’s a matter of clearing up a small discrepancy. Office Audits – The other end of the spectrum, in which the IRS sends people to your office to analyze your books for verification. This is what many people think of when they hear the word “audit,” and this has the potential to become as bad as an audit can get. Desk Audits – Falls somewhere in between. The matter is too complex, or the money involved too large, to handle via mail and phone, but it’s not so large as to demand a team to visit your place of business. They’re handled by one or more meetings with a revenue agent at an IRS office, and have a potential cost somewhere between the other two types of audits. 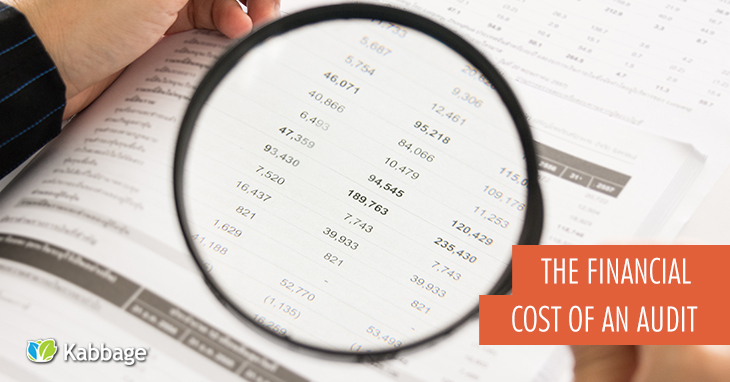 Costs of an audit fall into two categories: preparation costs and penalty costs. Preparation Costs are those associated with assembling the proof the IRS requires to demonstrate that you reported your income and expenses accurately. Depending on how organized your finances are, these costs run from negligible (the cost in time of finding, copying and sending in a specific invoice to prove costs) to potentially business-ending (the cost of taking five years’ worth of papers jammed into banker’s boxes and paying professionals to sort them for the IRS). Examples of preparation costs include the extra cost of employees for prep, hiring professionals, fees for a tax lawyer, forensic accounting and any internal audit costs necessary to answer the questions the IRS levies during the audit. There’s no way of giving a specific dollar amount to preparation costs. There are too many variables. In general, correspondence audits have the lowest preparation costs, while office audits have the highest. Another general rule is that it will cost less to do it yourself, presenting the feds with organized proof, than to let the IRS muddle through your documents (and charge you by the hour while they do it). Penalty Costs happen when the IRS punishes you for not doing your taxes right. Most penalties in audits come from interest – the IRS charges you 0.5 percent per month on money you should have paid but didn’t. Sadly, if the audit shows they owe you money, you aren’t entitled to any interest. Because the IRS has up to three years to audit you, you can begin the audit process already owing a significant amount in tax interest. The IRS will also assess penalties if you broke the rules – failed to report income, filed late, didn’t file at all, etc. These are typically also structured like interest – a percentage of the total amount owed for each month between when you should have done something and when you actually do it. Though the individual monthly fees are low, over time they can add up to a business-threatening amount of change. Criminal fines come in only if the IRS can prove that you intentionally lied about your income and expenses with the intent of defrauding the government of tax money. This is bad news. Don’t even think about risking it. Organize early and often. The better you track your business finances, the easier it is to both avoid costly mistakes and to prove that a mistake was the IRS’ and not your own. It also cuts down on the cost of preparing your taxes in the first place. Respond swiftly to IRS communications. It can be tempting to put those letters at the bottom of your to-do list, but remember the penalties accumulate over time. The less time, the lower the costs. Negotiate early and often. Installment agreements, penalty relief and offer in compromise arrangements are all part of a revenue agent’s job. If you’re looking at money you can’t afford to pay, you can negotiate to pay a lower amount of money. Go pro when necessary. Professional tax preparation is always smart for business owners. Professional audit help and tax negotiation can also make a significant difference. These services aren’t free, but they often cost less than the money they will save your business. Get audit protection if you use a service like TurboTax. These amount to insurance purchases in case you get audited. They won’t protect you if you gave incorrect information, but will defray much of the cost of a random audit. Finally, you may have noticed that most of the expenses associated with IRS audits grow with each month that passes before you resolve them. That’s great for companies with large cash reserves (which are, incidentally, companies less likely to be at risk for expensive audits). If your company is short on ready cash, a Kabbage business loan or small business line of credit can help you swat those small fees before they become major expenses.